Willis and his six brothers and sisters were all born in Indiana. Willis’s father, George Willis Alexander, was born in Louisville, Kentucky but his mother Sophia Mae Rice was born in Indiana. The young family of George Willis and Sophia Mae Rice was fractured when Sophia died in Tennessee in 1897, and George died in 1900 in Arkansas. The younger children were divided among relatives. As the second oldest son, Willis enlisted in Co. L, 4th Tennessee Volunteers on 23 June 1898. He was discharged May 6, 1899 after service in the Philippine Islands where he contracted malarial fever. 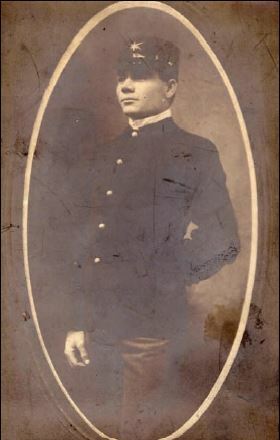 He re-enlisted with Co. F., U.S. Infantry 15 May 1899 and was discharged 14 May 1902 after having served in Manila, Philippine Islands and Cuba. In the 1900 United States Federal Census, Willis is listed as living in the Pinar Del Rio Barracks, Cuba, Military and Naval Forces. His military file describes him as 5′, 9″ tall with a fair complexion, auburn hair, and brown eyes. By 1908, Willis E. Alexander lived in Detroit. He resided at 168 Harrington St., and his future wife lived at 159 Harrington St. Undoubtedly they met as neighbors. At age 28, Willis Emerson Alexander died after being injured in an industrial accident in Detroit, four months before his only child was born. He was buried in the U.S. Army section of historic Woodmere Cemetery, Detroit, Michigan, just down the lane from his wife’s grave. This entry was posted in DeKalb County, Knox County and tagged Alexander, Bliss, Rice, Williston on July 17, 2014 by oahblog.